Has the color green ever frustrated you? Or do you get overwhelmed with all of those yellows and blues and then wonder which to use to mix your green? 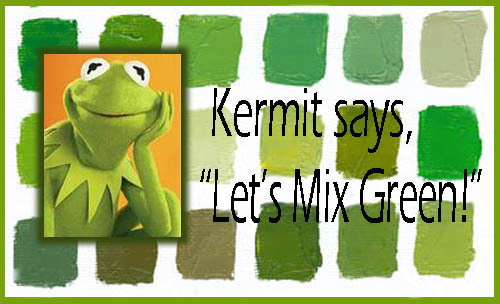 After reviewing and understanding two important color mixing concepts, you will learn how to mix bright and dull natural-looking greens with ease. Once you learn Carol's green-mixing strategy that is based on her Balanced Palette System, you will become a convert and love to mix green! You will also say good-bye to those unnatural-looking tube greens. Students will engage in a number of exercises to better acquaint themselves with their tubes of paint. In addition, they will create color charts that will be an invaluable resource for future paintings. If time allows, we will paint a “greens only” painting. Carol will demonstrate throughout the day to assure the information is processed to everyone’s satisfaction. She has worked in watercolor, acrylics, oils, pastels and water-mixable oils and is comfortable with all painting styles - from realism to non-objective to abstract. Though it is not typical to have all media in one classroom, Carol has discovered how this enriches the learning experience. Class Length: Six hours. For example, 9:30am to 4:30pm, which includes an optional 60-minute lunch break. Together, let's bring more art to life!